Real-time, online practice is the best way to prepare for the licensing exam. SWTP's 900+ exam questions include thorough rationales and suggested study links to help you understand both the content and process of identifying correct answers and passing the exam. "Awesome"..."Like the real test"..."Recommended!"... "I especially love the suggested study"..."Trains you to think like a test writer"..."So glad I found the site!" Find more customer feedback on our testimonials page. SWTP has helped thousands of social workers prepare for the exam. And they've saved money while doing it. See our pricing page for details on current offers. Don't forget, purchasing multiple exams at once in a bundle helps you save as much as possible. When you sign up with SWTP, you get our free Study Guide to the Social Work Licensing Exam. The guide includes free practice questions, study tips, test anxiety help, and lots more. Free! Use SWTP exams anywhere, anytime on your smartphone; no app necessary. If you haven't already tried SWTP on your cell, take a look! Three of them: Exam Mode (timed), Study Mode (untimed), and Review Mode (untimed, review your answers). All questions are accompanied by thorough Rationales, explaining the how and why of reaching the right answer, and by Suggested Study Links, opening the way to a deeper exploration and understanding of exam content. Track your progress, study by Content Area, and get prepared for the real thing! ASWB Exam. 170-question online practice exams. ASWB is the licensing exam for the entire U.S. and Canada. 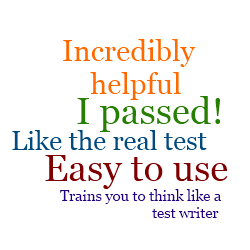 SWTP practice tests follow the ASWB clinical exam outline--people use them for all levels of exam prep with great success. Exams are four hours when timed. 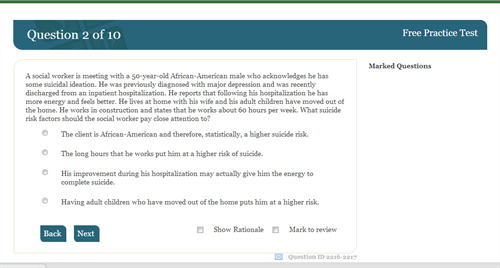 ASWB Ethics Booster For ASWB exam preppers who want some extra questions about social work ethics (a big part of the exam), this is a 45-question all-ethics practice test. Just $20. The Ethics Booster is suggested for those who have not taken our CA L&E practice test, since there's significant overlap between those two. ASWB DSM Booster SWTP's DSM Booster provides practice that focuses exclusively on assessment and diagnosis. The test includes more than 50 questions pulled from the pages of DSM-5, each with thorough rationales and suggested study links. Just $20. California Law & Ethics Exam Before Californians take the ASWB exam, they have to pass an additional 75-question, 90-minute California Law & Ethics exam. Use our California L&E practice test to get ready for it. You get 90 days of access with your purchase. That includes unlimited Study Mode access and three times through each exam in Exam Mode! Need more time? Just write us to request an extension. SWTP offers a sleek, user-friendly interface--desktop, tablet, and mobile. Try the free practice test to get a full sense of the site's capabilities.